STW Tractor offers repair and service on lawn tractors as well as on compact and smaller farm tractors. We are a home based business and have one mechanic doing all the work. We also work on snowblowers and other smaller units as well. WE ARE AVAILABLE MOST EVENINGS AND WEEKENDS FOR YOUR CONVENIENCE - GIVE US A CALL. Not sure if we can help or have a question - call. We usually have a much quicker turnaround time than the dealers. 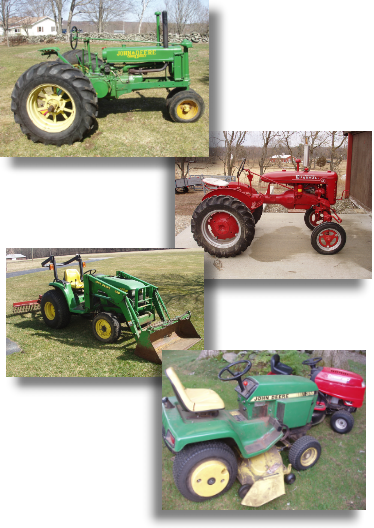 We also sell used tractors and implements as listed in the For Sale section of this site. Also have several old JD parts tractors and other miscellaneous parts, so e-mail with your needs and I'll let you know if I have it. We don't stock many new parts as we don't specialize in any one brand. We have experience working on old and new machines, and can handle most any repair except computer issues in the new machines. We also collect and have pulled antique tractors for years. Some of our equipment is available for sale.